Wooden Pretend Play Food Set and Wooden Kitchen Accessories. Pretend and bake delicious cookies perfect for role play food. Twenty pieces includes baking tray, mixing bowl, whisk, rolling pin, spatula, brush, oven glove, cookie cutters, cookies, and eggs. Wooden Cookie Baking Set is great fun and easy to play! Perfect Wooden Kitchen Accessories / Wooden Toy Food Set. The Wooden Cookie Play Food Set Toy explores role play and imagination through creative pretend play! Ideal for creative role play sessions to introduce the concepts of choice, taste and sharing. Pretend play food perfect accessory to any playtime Kitchen Toy. Bee Smart's wooden play food enhances hand and eye co-ordination and fine motor skills. Children will enjoy discovering new ways to play and learn for hours! This bright and colourful pretend play food wood toy set appeals to both girls and boys. Suitable for 36 Months +. Especially designed to work well with little hands. The kids play food items are perfectly sized for little hands. Bon appétit! Wooden cookie play food set has high quality wood and painting detail. Hand crafted and painted wooden pieces. Compliments other Wooden Toy Foods and Toy Kitchens. Not 100% satisfied? Just contact the seller and they will give you a replacement or refund. Bee Smart recognises that toys play an important part in a child's development and our quality range of wooden toys will make learning such good fun! Bee Smart's quality range of baby wooden toys are made from high quality, responsibly sourced materials using non-toxic paints. Conforms to current European safety CE standards. Check out Bee Smart's range and it's other wooden toys including play wooden food and pretend wooden baking toys for children and kitchen sets for toddlers. 20 PIECE SET, PRETEND & BAKE DELICIOUS COOKIES perfect for role play food. 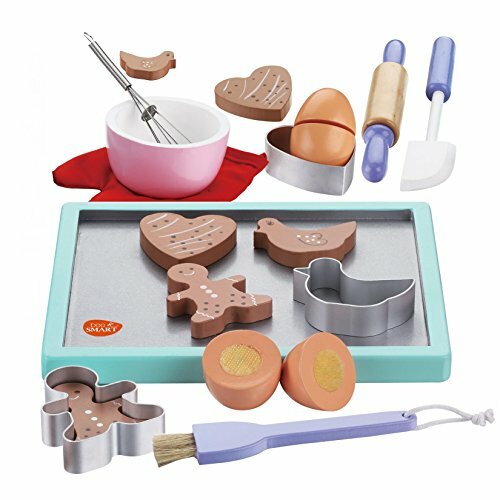 This 20 piece wooden play food set includes baking tray, mixing bowl, whisk, rolling pin, spatula, brush, oven glove, 3 cookie cutters, 6 cookies, and 2 eggs. PERFECT SIZE AND SHAPE FOR SMALL HANDS. Wooden Cookie baking set is great fun and easy to play! Perfect wooden kitchen accessories / wooden toy food set. IDEAL FOR CREATIVE ROLE PLAY SESSIONS to introduce the concepts of choice, taste and sharing. Pretend play food perfect accessory to any playtime kitchen toy. PROMOTES DEXTERITY, HAND & EYE CO-ORDINATION. The wooden toy food enhances creativity and fine motor skills. HIGH QUALITY, NON-TOXIC & SAFE TO USE. Wooden cookie play food set is high quality materials ensure durability and safety. Conforms to current European safety CE standards.